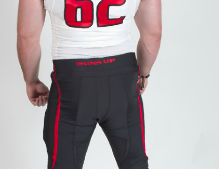 Gear Head - Texas Tech's New Unis. 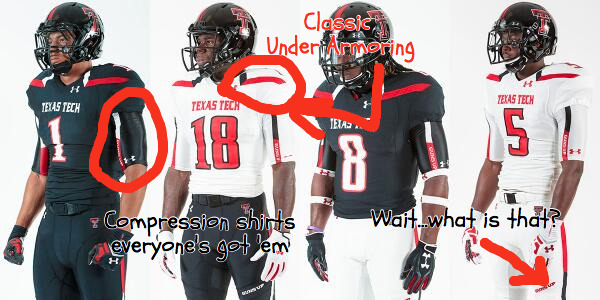 Gear Head takes a gander at Tech's new unis. Get your Guns Up or at least get them out and ready. We might need them. High marks for the video, heavy driving hip hop music, dancing, a little person wearing number 8, collar popping, smoke and fake gun play. I'm enthused. Let's do this. When you go with Under Armor you get...well Under Armor. Shoulder decor, bad fonts, and the overriding desire to protect your house. The Tech Tramp Stamp. Might as well be a bulls eye. The pants have the old, Guns Up on the right thigh. We'll gloss this "the holster". Is it a step up from the old tramp stamp? Maybe. Just remember these are uniform systems, they'll make you run faster, jump higher, tackle harder, block better and make child birth a pleasure. I for one am sick of compression shirts as a uniform compliment. I hate the way some put numbers on 'em etc. What's the point of doing curls if you can't show the guns off to the girls. The old bass boat sparkles. What Happened to the bass boat sparkles? The bass boat sparkles are gone from the Red Raiders head wear. What gives? That was the mostest awesomest thing of all! Now, they're just...well less sparkally. Surebud will never kick down a barn and not build a shed to store your antiques. Here are a few suggestions for how Tech might have gone that could have been better. Look at these beauts from the 80's. Yes kids everything was better back then. EVERYTHING. That for the record is Billy Joe Tolliver. A bit of a hell raiser as I recall. That's also James Gray, number 31, his son Jonathan plays for the Texas Longhorns and is set to make more money than his old man ever did. Crisp lines, clear theme. Great font. SOCK STRIPES! Check out the helmet from 1976! That facemask by the way should be mandatory for all football players. Red facemask. Bolts clearly showing. By the way, they're called RED Raiders. How about we mix in a Red Jersey. I know black is all murdered out and what not but come one. The red looks real good. I love this font from the early 2000's. Very UCLA Bruinish from the 60's and Kansas b-ball. The Bruins have surrendered this font, so has Kansas. They had protests in Lawrence when the Jayhawks gave it up. Tech can rightly take it back. Tech used to wear gray pants and they looked pretty freakin sweet. Now normally the bud hates a non school color in the scheme but exceptions can be made. By the way this is Zebbie Lethridge. 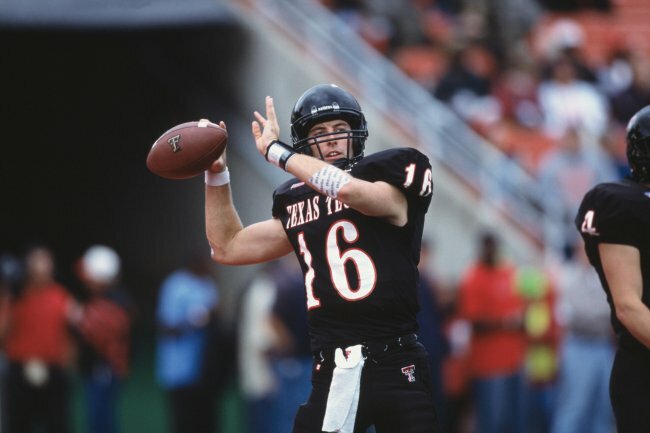 Lubbock Legend. Zebbie won 22 million in a jury verdict after he was wrongly accused by Dillards of stealing some $13 earrings. Lethridge also wore SPATS! Can we bring these back? They're beautiful. By the way, if you look at the photo below you'll see an all time great uniform from Air Force in 1995. THUNDERBOLTS! Posted on August 6, 2013 by Sure Bud and filed under Sports and tagged Gear Head Texas Tech Under Armor.